It is imperative that each of the 300,000 specimens in the collection can be reliably and immediately accessed and slightly different systems are used for the different plant groups (algae, ferns, flowering plants etc.). However, for all these groups the same basic principles apply: all material in a group is arranged according to an established system which places related material close together and to which there is an index. The specimens are then further divided based on their geographic origin. Irish & British plant material has recently been reordered to follow the APGIII linear arrangement. 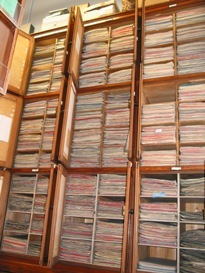 Some material remains unincorporated; often this consists of new collections or very difficult to identify older material; possibly, in both cases, comprising species new to science which, hence, cannot be identified until they are first described.